The Twenty-ninth United States Congress was a meeting of the legislative branch of the United States federal government, consisting of the United States Senate and the United States House of Representatives. It met in Washington, D.C. from March 4, 1845, to March 4, 1847, during the first two years of James Polk's presidency. The apportionment of seats in the House of Representatives was based on the Sixth Census of the United States in 1840. Both chambers had a Democratic majority. December 2, 1845: President Polk announced to Congress that the Monroe Doctrine should be strictly enforced and that the United States should aggressively expand into the West. During this congress, two Senate seats were added for each of the new states of Texas and Iowa. During this congress, two House seats were added for each of the new states of Texas and Iowa. This list is arranged by chamber, then by state. Senators are listed by class and Representatives are listed by district. Senators were elected by the state legislatures every two years, with one-third beginning new six-year terms with each Congress. Preceding the names in the list below are Senate class numbers, which indicate the cycle of their election. In this Congress, Class 1 meant their term began with this Congress, facing re-election in 1850; Class 2 meant their term ended with this Congress, facing re-election in 1846; and Class 3 meant their term began in the last Congress, facing re-election in 1848. The names of members of the House of Representatives are preceded by their district numbers. (2) Vacant Senator Daniel E. Huger resigned in previous congress. 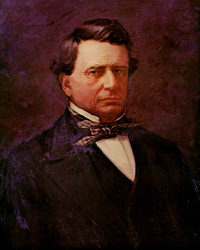 (2) Robert J. Walker (D) Resigned March 5, 1845, after being appointed U.S. Secretary of the Treasury. Successor appointed November 3, 1845. (2) Benning W. Jenness (D) Lost election to finish the term. (3) George McDuffie (D) Resigned August 17, 1846. Lists of committees and their party leaders. Congressional Directory for the 29th Congress, 1st Session. Congressional Directory for the 29th Congress, 2nd Session.